Vacuum Lifter for rapid loading and unloading of loose loaded goods in trailers and containers. Developed specifically for full working capacity in confined spaces with low headroom height. 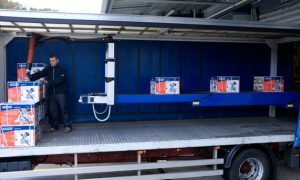 Unique vacuum lift concept to solve ergonomic and productivity issues when loading or unloading trailers or containers. Suitable for handling of most types of goods weighing up to 40 kg. The lift automatically adjusts to fit inside containers and trailers of different size and shape. Vaculex ParceLift can be fully integrated with Caljan BeltTrack telescopic boom conveyors. ParceLift is used by many Distribution Centers and several large Parcel Carriers. Vaculex ParceLift is a vacuum lifter specifically designed for rapid loading and unloading. With Vaculex ParceLift you can load or unload loose loaded goods in trailers and containers faster than ever before. Vaculex ParceLift uses cutting edge vacuum technology which enables for an increase of the productivity when unloading or loading loose loaded containers or trailers. It drastically reduces the risk for repetitive strain injuries and makes the work a lot easier compared to manual lifting. Vaculex ParceLift can be used for handling of a wide variety of goods – our vacuum solution works perfectly with parcels, boxes, sacks, food, baggage, sheets of metal etc. Vaculex ParceLift is easy to work with and requires only a short training session. To ensure maximum performance Vaculex ParceLift is engineered with low weight/high strength materials such as carbon fibre composites and aluminium. This enables Vaculex ParceLift to be very well suited for rapid material handling due to minimal operator effort to handle the equipment very rapidly. Vaculex ParceLift automatically adjusts its inbuilt height to suit different sizes of containers; this is to ensure maximum working height inside the container currently being loaded or unloaded is always maintaned. Vaculex Vacuum ParceLift can be ordered with options such as lighting and air heater to even more enhance the working environment inside the container. Accessories also includes special control units with suction foots for lifting baggage and suction foots for parcels and other goods. Vaculex ParceLift is assembled onto a telescopic conveyor. The telescopic conveyor may already be installed on your site or it may be obtained with the ParceLift preinstalled. Vaculex has a cooperation with Caljan Rite Hite, one of the most well known manufacturers of telescopic conveyors in the world.